This band is from Harrisburg, Pennsylvania. They have a generally fuzzy garage band sound. 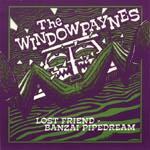 Usually performing pop-psych vocals, they have also given us a surf instro called "Banzai Pipedream". This surf instro features a reverbed lead guitar, which it sounds cool against the fuzz rhythm guitar. The melody line is solid, and the music is infectious. A fine track.